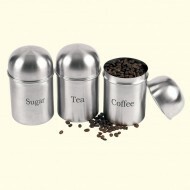 Contemporary Coloured Storage Canister Coff.. Contemporary Coloured Storage Canister Suga.. Contemporary Coloured Storage Canister Tea ..
Lyndhurst Storage Biscuit Jar ..
Set of 3 Brushed Steel Storage Canisters with..